To produce literature for his physiotherapy clients, my friend Dag was over at our studio on the weekend posing Willow with exercise balls, rubber bands and other physio-related props. Here's an outtake in our moments between shooting. 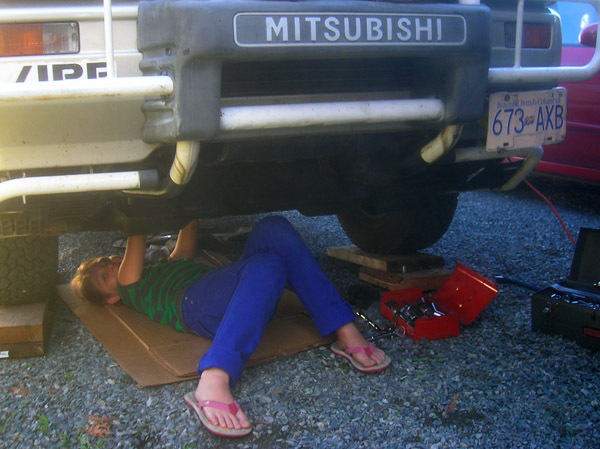 Had to do the first minor repairs to our awesome Delica van this weekend. I was able to reach into the belly of the beast and loosen a couple of the nuts but it took Ocean with her child-sized hands to adjust the belt tensioner screw and truly make the difference between squeak and no-squeak.